After five years of drought, farmer Edivaldo Brito says he cannot remember when the Boqueirao reservoir was last full. But he has never seen it this empty. "We've lost everything: bananas, beans, potatoes," Brito said. "We have to walk 3 kilometers just to wash clothes." After two years of rationing, residents complain that water from the reservoir is dirty, smelly and undrinkable. Those who can afford to do so buy bottled water to cook, wash their teeth with, and even to give their pets. "If it does not fill up, the city's water system will collapse by mid-year," says Janiro Costa Rego, an expert on water resources and hydraulics professor at Campina Grande's federal university. "It would be a holocaust. You would have to evacuate the city." Water will be pumped over hills and through 400 kilometers of canals into dry river basins in Ceara, Rio Grande do Norte, Pernambuco, and Paraiba, the small state of which Campina Grande is the second-biggest city. In early March, Temer plans to open a canal that will feed Campina Grande's reservoir at the town of Monteiro. The water will still take weeks to flow down the dry bed of the Paraiba river to Boqueirao. 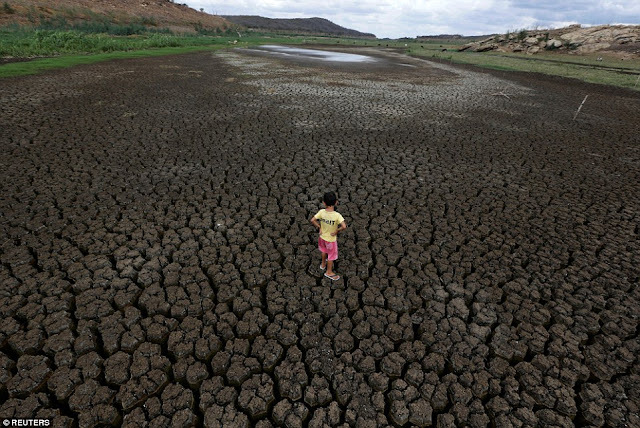 The reservoir supplying Sao Paulo, Brazil's largest city and a metropolitan region of 20 million people, nearly dried up in 2015. The capital, Brasilia, resorted to rationing this year. While that city will also get water from the Sao Francisco project, it will not arrive until at least year-end because contractor Mendes Junior abandoned work after being implicated in a major corruption scandal. "Water from the Sao Francisco river is vital," Ceara Governor Camilo Santana told Reuters. He said the reservoir can supply Ceara only until August. Ceara has had to cut back on irrigation, hurting flower and melon exporters, cattle ranchers and dairy farmers. They stand to flourish when the transfer comes through, but quenching the thirst of the cities will take priority. In Campina Grande, a textile center, companies including industry leaders Coteminas and Alpargatas have curtailed expansion plans and drastically cut back consumption by recycling the water they use. There, too, new water will first go towards solving the crisis in Campina Grande and surrounding towns. Only then will officials think about agriculture. "First we have to satisfy the thirst of urban consumers. Only then can we think of producing wealth," said Joao Fernandes da Silva, the top water management official in Paraiba. Rationing has particularly hurt poorer urban families. Many have no running water or water tanks and instead store water in plastic bottles. For those who have waited decades for the Sao Francisco transfer, they will believe it only when they see the water flow. Brito said he and his neighbors survive on the social programs that were the hallmark of Lula and his Workers Party administration. Though tainted by corruption allegations, Lula remains Brazil's most popular politician ahead of presidential elections next year. "Without the Bolsa Familia program, we would be dying of hunger," said Brito, who believes shortages could persist even after the river transfer. "It's political season again, so they promise us water, just for our votes."